Two weeks is barely enough time to thoroughly explore your hometown, let alone a place as fascinating as New Zealand. For adventurers on a tight time-budget, this 15-day trip wraps up the must-sees of both islands with a nice little bow. Check out the Coromandel Peninsula’s gorgeous beaches, hang with the Maori in a traditional village, walk the beaches of Kaikoura and get your adrenaline fix in Queenstown. Consider this your New Zealand starter kit. This tour is perfect for anyone looking at exploring New Zealand on a limited budget or timeframe. New Zealand has so much to offer, but this is a great way of getting a full overview of both islands in just two weeks. Day 1: Auckland – Arrive at any time. There are no activities until an evening welcome meeting, so feel free to explore before your welcome meeting, but make sure you’re back in time to meet the group. After introductions, your CEO will review the details of your tour. Please note that normal check-in times apply at our start hotels, but you can usually store your luggage for the day if you arrive early. 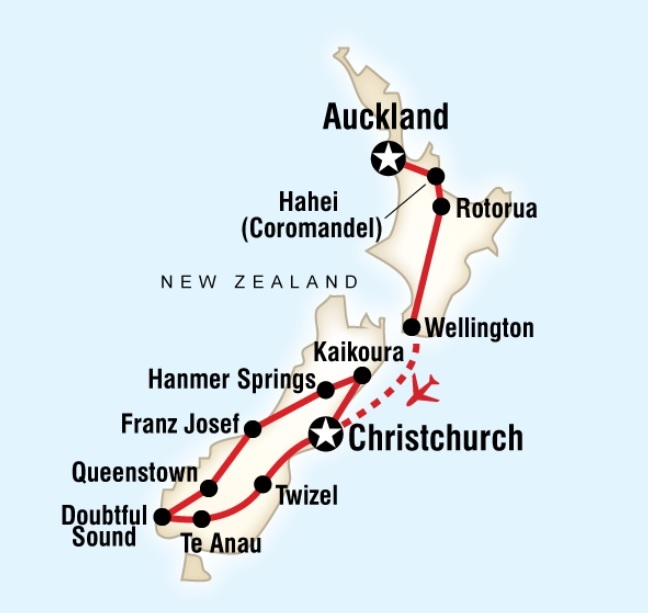 Day 2: Auckland/Hahei – Depart early for the stunning Coromandel Peninsula. Take a walk to Cathedral Cove or opt out in favour of sea kayaking. If the tide is right, grab a shovel and dig a natural jacuzzi in the sand on Hot Water Beach. Coromandel Peninsula Visit (Hahei) – The Coromandel is one of many scenic regions of New Zealand. Set off into the mountain forest in search of the elusive “Hairy Moehau” monster. Check out the beaches and cliffs and keep your eyes peeled for dolphins and whales. Make friends with the locals, including “hippies” who arrived in the 1970s and never left. Cathedral Cove Scenic Walk: Cathedral Cove (1h-1h30m. 2-4km) – Pack your swimsuit and walk from the north end of Hahei Beach along a cliff-top path that leads down to Cathedral Cove. A giant arch formed into the headland separates two secluded coves. Swim, lay in the shade, and enjoy the beauty of this idyllic spot. Recharge – Hot Water Beach Excursion: Hot Water Beach is a unique spot on the Coromandel Peninsula. If the tide is right, you can dig into the sand to create a natural jacuzzi. 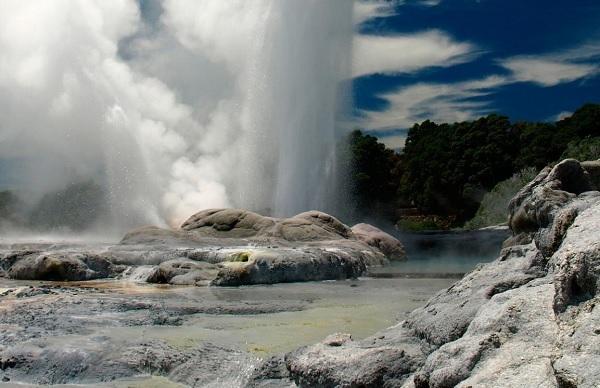 Day 3: Rotorua/Maori Village – Visit Rotorua and opt to check out the geothermal area or go whitewater rafting. Later, enjoy a cultural overnight in a Maori village featuring a traditional hangi dinner and show. Rotorua sits over an active volcano with bubbling mud pits and multi-coloured pools in different areas around the town. Opt to visit one of the sites, like Hell’s Gate, or go whitewater rafting nearby. In the evening visit a Maori village for traditional ceremonies, a Hangi meal and entertainment. After dinner, lounge by the bonfire and have some time to get to know the Maori hosts. Accommodation – In a Maori wharepuni (sleeping house). Groups will often stay together in one sleeping house (multi-share, mixed gender), staying in line with Maori traditions. Local Living: Maori Village Visit with Overnight stay. Visit the Tamaki Maori Village. Receive the traditional Powhiri welcome ceremony followed by a captivating stage performance explaining Maori history and culture. For dinner, enjoy a traditional Hangi meal, similar to the Hawaiian Luau, with dishes cooked in the ground. After, enjoy some quiet time with our Maori hosts by a fire. Day 4: Rotorua/Wellington – Take in the ever-changing scenery of the North Island and travel to the capital, Wellington. Day 5: Wellington – Enjoy the atmosphere in this relaxed but lively city. After an orientation walk, enjoy a free day to explore. Opt to visit the Te Papa Museum or take the cable car up to the botanical gardens. Orientation Walk (30m-1h) – Enjoy a brief walk with your CEO. He/she will give you some tips on finding things like supermarkets, main squares, and ATMs. For more specific or in-depth information, an official guided tour is recommended. Free Time: Wellington – Spend some time exploring the city. Day 6: Wellington/Kaikoura – Fly to the South Island, then travel to the seaside town of Kaikoura, known for its volcanic black-sand beaches. An earthquake in November 2016 greatly damaged road and rail access to Kaikoura. As a result, all groups will fly from Wellington to Christchurch on Day 6 until the road and rail north of Kaikoura have been repaired. Completion is expected in late 2018. Day 7: Kaikoura/Hanmer Springs – Opt to swim with dolphins or go whale watching during a free morning in Kaikoura before travelling to Hanmer Springs, stopping en route for a wine tasting at a local winery. Opt to take a soak in the hot springs. Winery Visit: Hanmer Springs – Stop at a local winery and opt to sample some of the wines produced on site. Free Time: Hanmer Springs – Enjoy the beautiful surroundings. Day 8: Hanmer Springs/Franz Josef – Travel across the Southern Alps via the stunningly scenic Arthur’s Pass. Go for a hike in the mountains or rainforest. Stay in the rainforest near the world’s fastest moving glacier. Arthurs Pass walks: Arthur’s Pass (30m-45m) – Stop midway through Arthur’s Pass to stretch your legs and go for a short hike or two. The beautiful scenery and fresh air will keep you going for the rest of the ride. Possible stop at Castle Hill, a location used in the films The Lion the Witch and the Wardrobe and The Lord of the Rings. 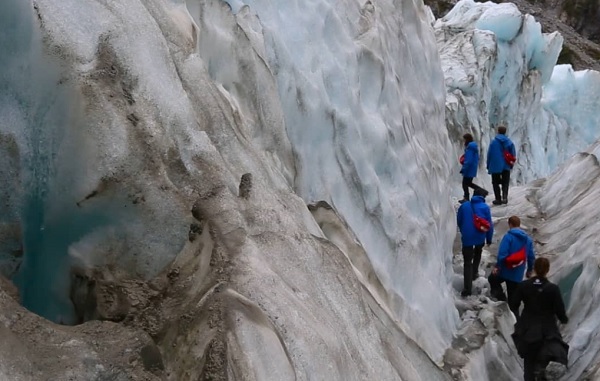 Day 9: Franz Josef – Enjoy a free day to explore the area around Franz Josef. 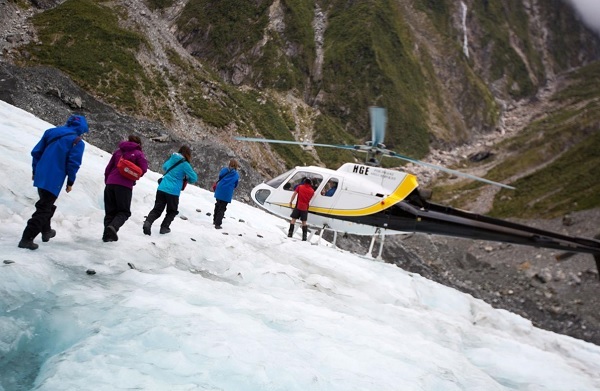 Opt to explore the glacier with a heli hike. There are dozens of optional activities in the area to suit just about any budget and preference. Try heli hiking, scenic helicopter flights, horse trekking, quad biking, skydiving, glacier valley walk, lake kayaking or a hot pools visit. There’s plenty to see and do in Franz Josef, and we wanted to make sure that you had some time to take it all in. Feel free to relax or try optional activities like a glacial hike, quad biking, and a helicopter hike. Your CEO has more ideas if you need them. Just ask! Day 10: Franz Josef/Queenstown – Continue to Queenstown, the adventure capital of the world. With beautiful scenery and tons of activities, there’s something for everyone. Enjoy the great night life. 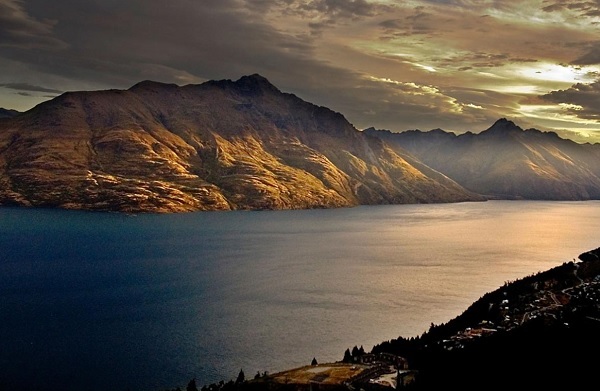 Day 11: Queenstown – With free time here, opt to go bungee jumping (in its birthplace), jet boating (also born here! ), skydiving, paragliding, hiking or mountain biking. Or take it a little slower and travel by gondola to the top of a local peak. Day 12: Queenstown/Te Anau – Enjoy the stunning scenery of Fiordland National Park and Doubtful Sound on a day cruise. Take in the waterfalls and wildlife. In the evening, opt to boat across Lake Te Anau and visit a cave that is home to thousands of glowworms. Doubtful Sound Wilderness Cruise: Doubtful Sound – Cruise through the stunning Doubtful Sound, one of the most untouched, remote places in the world. Marvel at the steep cliff walls and cascading waterfalls, and keep an eye out for area wildlife: dolphins, penguins, seals, and a variety of birds. Want to get closer to the water? Feel free to use one of the boats’ sea kayaks to explore the area more in-depth. Te Anau Glowworm Caves: Te Anau (88NZD per person) – Head underground to see the mysterious and beautiful glowworms that magically shine bright deep in limestone caves. Learn about local history, and experience an unforgettable, one-of-a-kind natural wonder. Day 13: Te Anau/Twizel – Head through the centre of the South Island to Twizel, near New Zealand’s highest peak, Mt Cook. Day 14: Twizel/Christchurch – Stop at Aoraki/Mt Cook National Park and spend the morning hiking the region surrounding Mt Cook, taking in the alpine scenery. Learn more about mountaineer Sir Edmund Hillary at the Aoraki/Mt Cook Visitor’s Centre. Continue on to Christchurch for one final night together. Travel to the Garden City of Christchurch, a little piece of England in New Zealand, still recovering from a devastating earthquake. Mount Cook Visit: Mount Cook – Aoraki/Mount Cook is both a village, a national park and the name of New Zealand’s highest mountain. Located in central South Island, the park includes a mix of rocks and glaciers, as well as alpine plants including the world’s largest buttercup, the Mount Cook lily. There are several short walks that reward with spectacular views. Visitor’s Centre: Twizel: Stop by the visitor’s centre to learn more about the region. Scenic Flight: Twizel – Take to the skies and get a bird’s eye view of the gorgeous landscape from above. Recharge your camera and go snap happy! Day 15: Christchurch – Depart at any time. Not ready to go home straight away? Contact us to discuss a wide variety of additional stay options, from a few days on the beach in Australia, to an extended stopover in the Middle East. Travel Style – Classic: All of the highlights, culture, access, and I-can’t-believe-we-did-that moments, all at a great price. Service Level – Standard: Comfortable tourist-class accommodations with character; mix of public and private transport. Physical Rating: 3 – Average: Some tours may include light hiking, biking, rafting, or kayaking in addition to walking. 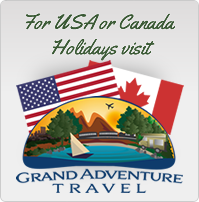 Age requirement – All travellers under age 18 must be accompanied by an adult.